I am in quite the predicament and none of my studies have gone over this! 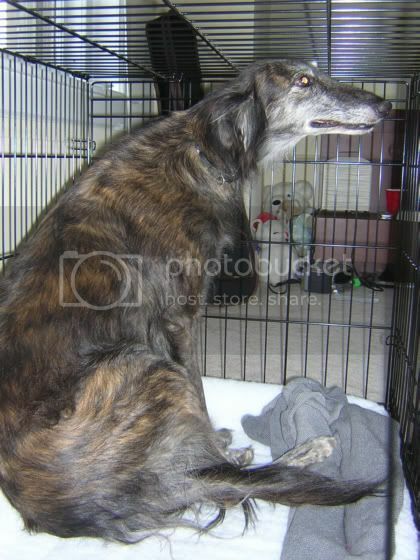 I just adopted a 7 year old female Silken Windhound (she is a sighthound, similar to a greyhound and borzoi). She flew here on an airplane yesterday morning, landed around 9. By the time everything was settled it was around noon. She's extremely well behaved but I'm only having one problem: She will not leave the crate we had ready for her. We decided to crate her initially due to having cats. She sniffed around at first then when I led her to the crate she seemed to think it was comfortable and curled up in it. I rewarded her with some love because that is what I had read to do. Now I can't get her out of the crate for more than 1 minute before she goes back to it. I'm confused at what to do because if I be assertive I am afraid she will get the message that the crate is a bad place to be. I have tried to entice her out by laying her bed (from the crate) at the couch. She went straight back to the hard plastic floor of the crate (and is still there)! I might want to add as well that this is a rather new environment for her. She was raised in Iowa (but traveled a lot on loan as a breeder) and is now in Downtown Atlanta. I have no doubt that she is pretty shocked from the new surroundings. Should I just give her time to get out of her crate? Should I stay in the same room with her in the meantime? Should I get her out and shut the doors until bedtime? Thank you for all your help...all the books go over how to get your dog IN the crate, but not out of it! Well I do have a couple of her in there + 1 when she tried to lick the camera She seems pretty happy, just a little scared! She is so well behaved and already house trained that we decided we were just going to leave the crate doors open and buy a seperater for the bedroom door so in case the cats need to escape they can just jump over (chubbies need the excercise anyways, lol). I would expect that some time and affection will eventually coax her out of the crate. She probably feels safe there after a long and stressful trip and needs some time to decompress. If you put her food down away from her crate, between that and (hopefully) the call of nature, she should come out on her own. 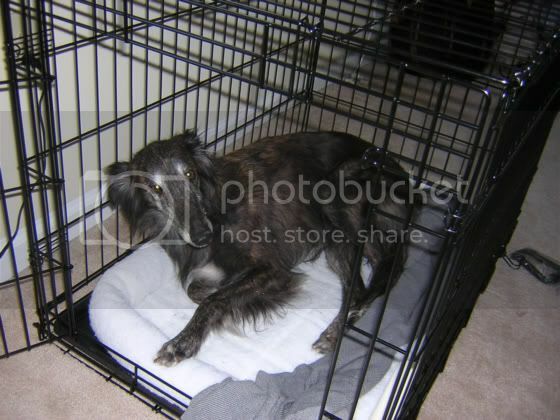 Hi I think your dog feels safe in her crate and when she is used to her new surroundings and all your family I think she will come out, I wouldn't rush her let her do it in her own time,by all means feed her out of it, and leave the door open, I'm sure she'll come out when she feels settled. Let us know how you get on. 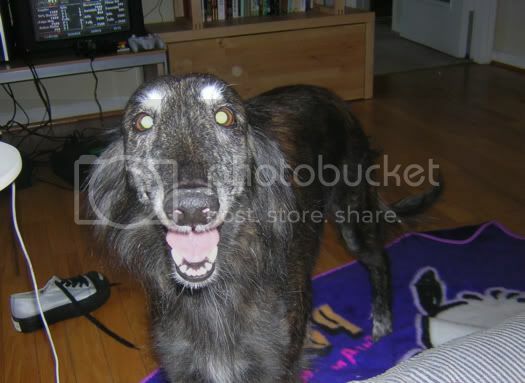 ~*~*And he says 'Rhiannon don't go.... Rhiannon stay'.... And he still cries out for her.... 'Don't leave me.... don't leave me now'....*~*~"
Hi and welcome to the forum to you and your new dog. Like the others say it will just take time and patience for her to get to know you and trust you and to get her to come out o eat. Is there anything she specially likes as a treat a bit of chese or a pioeceof chicken!!! perhaps you could try enticing her out with that. 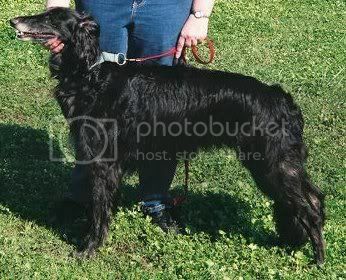 I have borzois so I know how stubborn sighthounds can be. She looks a lovely dog how old is she? Good luck and do keep us up to dat ewith her progress hopefully or the lack of it (hope not). Just noticed you already said she was 7 sorry. Beautiful pics Yep, I agree with everyone here so far, give her time and she will come out on her own accord - she's been through a lot the last few days.